is very busy with traffic and people who are on vacation. Commerce For Providing The Safety Tips As A Public Service Announcement. you can drown in the ocean. * Only Swim On Long Beach Island Guarded Beaches. * Never Swim Alone – It is Very Dangerous To Swim Alone. * Always swim near a Long Beach Island lifeguard. * Do not go on the LBI beach or in the water if you hear thunder or see lightning. * Do not dig holes on the beach deeper than the user’s knee (especially children). The sand may collapse and sufficate you. Thank You To Bob Irvine For Making “LBI Rip Current Awareness” A Priority On Long Beach Island, New Jersey. * What Are Rip Currents? Rip Currents are ‘channeled’ currents of water flowing away from or parallel to the beach. They typically occur when a channel forms between the shore and sandbar, also, near structures such as jetties and piers. * Why Are Rip Currents So Dangerous? Rip currents pull people away from the beach. Their speeds can vary from moment to moment and can quickly increase to become dangerous to anyone entering the surf. * What If I’m Caught In A Rip Current? STAY CALM. Don’t fight the current. Swim in a direction following the shoreline – across the direction of the water flow. When free of current, swim at an angle – away from the current – toward the beach. * Cross LBI streets with caution. * Cross at LBI controlled intersections. * Use sidewalks when available. * Stay Off The LBI Dunes – It Is Against The Law To Walk On The LBI Dunes On Long Beach Island, New Jersey. * Use designated paths to and from the LBI beach. * Stay off the grassy areas on the dunes; Poison Ivy is commonly found growing on the dunes. * Dune grass is very vulnerable and is a natural protection against storms. * Leaves are always in threes, two leaflets split by a third, with a slightly longer stem. * If exposed, repeated washing with cold water and soap will remove the poisonous oil from skin and clothing. * Use the LBI center lane for left turns ONLY on Long Beach Island. * Obey all speed limits – watch for changes in speed limits. * Remain on Long Beach Boulevard during times of heavy traffic. * Avoid causing gridlock at intersections. * Park with the flow of traffic – do not park in opposite direction. * No parking within 50 ft of a stop sign. * No parking within 25 ft of an intersection. * Pull as far to the right as possible and STOP for emergency vehicles. * STOP for school buses on Long Beach Island. * STOP – then proceed with caution for ice cream trucks. Note: While On Long Beach Island, NJ – Please Do Not Feed The Sea Gulls. on Beautiful Long Beach Island, NJ. *** Please No Phone Calls After 10 PM Or Before 9 AM E.S.T. 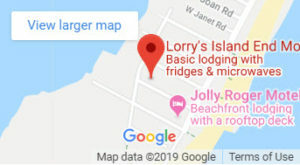 Lorry\'s Owner Thanks You For Your Lorry\'s LBI Motel Vacation!